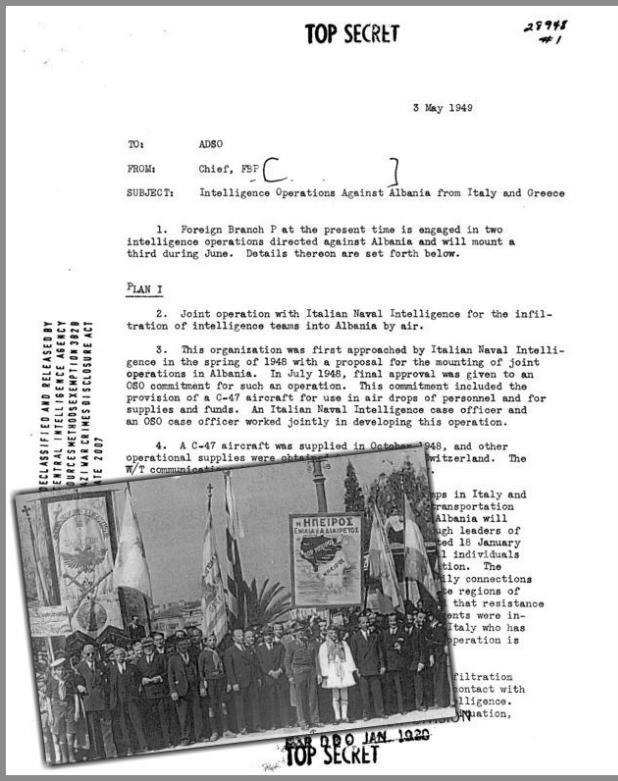 During the years 1949-1950 American CIA predicted its operations from Italy and Greece to overthrow the communist government led by Enver Hoxha. CIA gathered information on how people can engage in and outside Albania for its operations. In 1948-1949 the CIA attempted in thee operations to throw agents and supplies to groups that were in Albania for the collapse of the communist regime. The first operation took place in July 1948 from the air, where planes launched from Italy threw boxes with weapons and food supplies for their groups. In October 1948 a C-47 aircraft threw again supplies. In January 1949 the CIA came into contact with Greek extremist groups in Greece, they fought for the annexation of Southern Albania-Northern Epirus. They agreed with leaders of the organization "Central Committee for Liberation of Northern Epirus-KEVA" for organizing groups of agents in Albania. This group was directed by KEVA secretary, Stefanos Venakidhis, employee in the National Bank of Greece and Nikolaos Pagos a doctor by proffesion, who was vice president of KEVA. (For many years head of the secret organization KEVA was archbishop of Greece, Serafeimi, who directly participated in genocide against the Albanian population in 1944. The Archbishop Serafeimi-Visarion Tika was a close associate of Napoleon Zervas, who took care of the soldier of EDES Visarion Tika to become the bishop of Arta and Ioannina after the war with the name Serafeim. 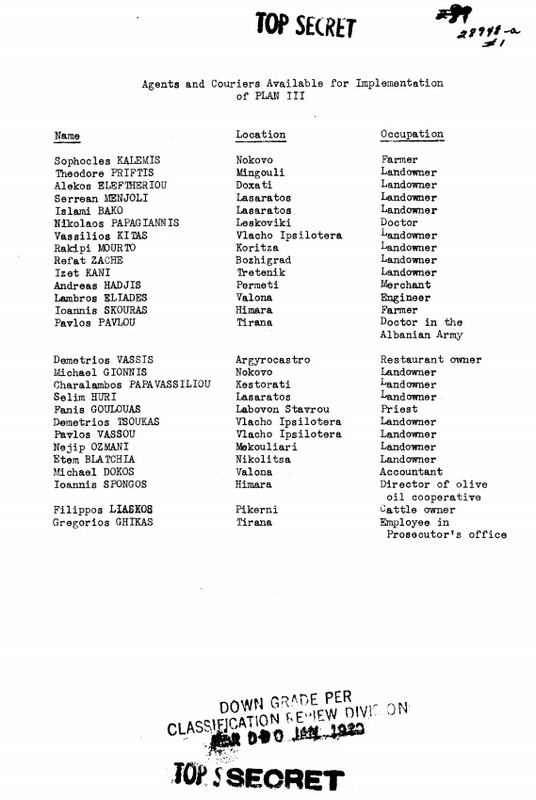 The CIA report of 3 May 1949 provides data that the Greek organisation KEVA has in southern Albania 18 agents and 15 couriers in Gjirokastra, Leskovik, Permet, Vlora, Korca and Himare. KEVA also has available 5,000 active members in Greece and 2,300 in southern Albania. Plan III of this operation, which was approved on March 1, 1949, includes the use of personnel from KEVA, the largest organization of Greek refugees from southern Albania (known as Northern Epirus), in order to collect intelligence. Agents for this operation are Venakides Stefanos, Secretary of KEVA organization, another employee at the National Bank of Greece, and Nikolaos Pagosa, a doctor and deputy of KEVA. These two individuals were engaged for a long time to insert agents in southern Albania. They report a total of 18 active agents within and near the Albanian city of Gjirokastra, Leskovik Përmet, Vlora, Gorica and Himare. At the moment there are 15 couriers available for cross-border. A list of 27 agents and couriers of KEVA with their locations and occupations is found in the appendix of this document. KEVA organizations, as stated in our memorandum dated January 18, has extensive functions that include activities to help (humanitarian activities) and resistance in Albania. Is reported that this organization has an active membership of 5,000 people in Greece and 2,300 in southern Albania. The goals of this operation include gathering intelligence for the resistance organizations in the South and their plans and programs, data about ports and airports installations, the level and nature of assistance for Greek rebels from Albanians and the order of battle. Couriers will be sent across the border with Albania to initiate the organization of the network of agents in Albania to achieve these goals. All known agents, potential agents and couriers are checked in files of OSO for denigrating information. This operation is now being raised. The seat is currently in Athens, but planned to establish an advanced operating in Ioannina. It is expected that the first courier teams, which operate under our direction and control to be shipped within the next six weeks. Five telegraphers are currently under training in Greece. Telegraphy communications will be established as soon as possible on a station in Greece. While it accepted a small number of reports of value, resulting from the activities of two Greek officials of KEVA, identified above. Is expected that the useful productivity of this operation will increase significantly when the direction and our support will be felt.